I injured myself two weekends ago (believe it or not, it was NOT while hunting a perfect photo position, but just out enjoying a warm, sunny day!). Unfortunately, I have not been able to get out and capture anything new. Luckily, I still have some photos to share from recent adventures, and hope to be back on my feet by next weekend so I can get out and take something. I am feeling all out of sorts having not taken any photos in over two weeks! 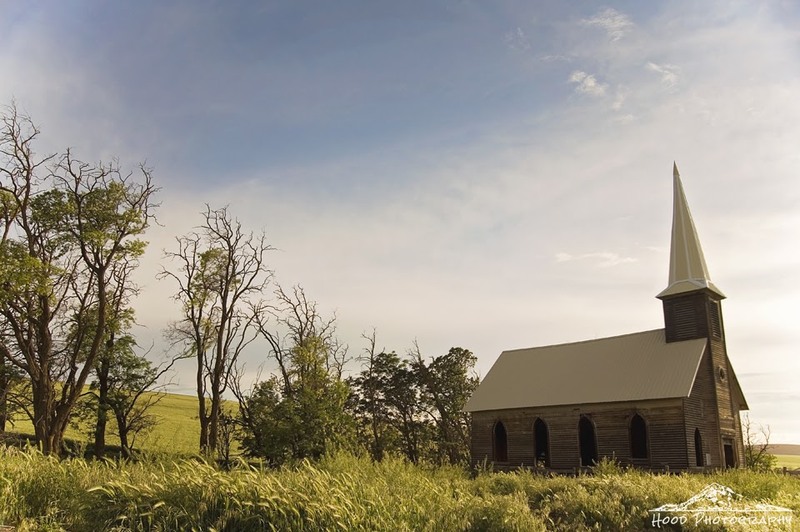 This is Locust Grove Church, located outside of Wasco, Oregon. There used to be a whole community called Locust Grove, but it is now consists of only this old abandoned church and a few old homesteads. The church was built back in 1895 and was used until 1914. It has sat empty on private property this whole time. It certainly does feel drawn out of the past. Terrific shot! Nice shot of that old church. Hope you are healing! I'm so sorry you are hurt Sarah, I hope you heal completely and soon. Beautiful photo of the church. The church is in pretty good shape for being abandoned. Great photo. I like how you composed it. Best wishes on feeling well soon. Oh wow, this is a beauty. but, then again, all your shots are so stunning. I love visiting you here.